The holiday season isn’t complete without a little bit of chocolate, right? This easy, no-bake recipe is quick to prepare and is a good one for little helpers, who can enjoy rolling the mixture into balls. You can customize this recipe with different spices – mint, orange zest, cloves, matcha, etc. – and if nut allergies are an issue, swap the almonds for sunflower seeds. You may want to make a double batch, as these are gobbled up quickly! Throw the almonds into a food processor and pulse a few times until they are broken up into smaller chunks. Add the buckwheat and pumpkin seeds and blend for about 30 seconds, until everything becomes a coarse meal. Add the maple syrup, cinnamon, vanilla and salt and blend until the mixture becomes a dough. You should be able to pinch it together with your fingers (the dough will be sticky). Finally, add in the cacao nibs and pulse to incorporate. Using wet hands, roll the mixture into small balls (about 1 tbsp each). 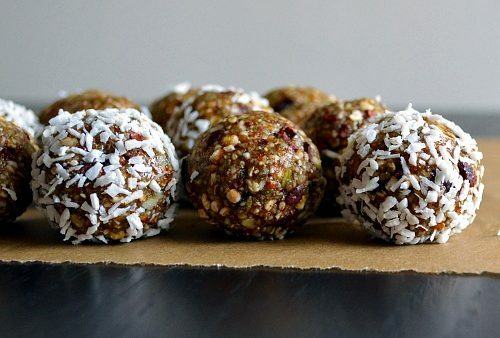 If you’re rolling the balls in a coating (coconut or cacao powder), do that now. Place on a plate lined with parchment/waxed paper. Put the plate in the fridge for 15 minutes. Transfer the bites into a sealed container. Store in the fridge or freezer.